This was drawn with a 0.5mm mechanical pencil, on a 8�" x 11" High Bright (87) smooth finished paper. Finished off with a thick layer of Workable Fixatif. Ewwwww, scary! 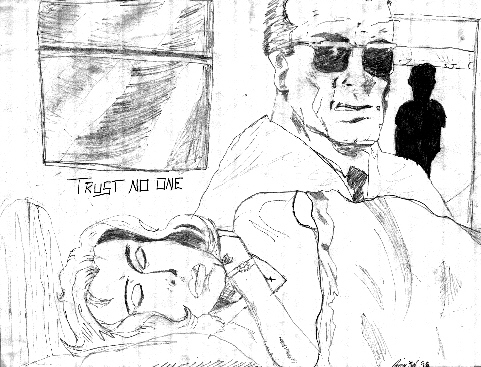 This a comic drawing of a scene taken from various comics, I took that scarey Agent looking dude from a XF comic. The guy standing in the door is Mulder. BTW, I drew this one like 3 years ago. Kinda cool I guess.